Biomedical Warming and Thawing Devices Market size was valued over USD 138 million in 2017 and is expected to witness more than 10% CAGR from 2018 to 2024. Increase in number of accidents and trauma cases leading to blood transfusions will foster biomedical warming and thawing devices market growth over the projection years. According to the World Health Organization, injuries resulting from traffic collisions, drowning, poisoning, falls or burns account for 9% of global mortality. Furthermore, growing demand for in-vitro fertilization and artificial insemination processes due to rising incidence of infertility have impacted the market demand positively. With increasing application of thawing devices in pharmaceutical industry and biotechnology studies such plant tissue culturing, animal tissue culturing and many other potential applications, the demand for warming and thawing equipment will rapidly increase in near future. In addition, increased application of thawing devices required for cryopreserved cells has propelled the market growth. Growing government initiatives around the globe has helped the healthcare sector by providing superior quality medical devices which in turn has fostered the market growth. Technological developments pertaining to automated thawing devices has enabled an efficient thawing process, hence increasing its application in most of the blood banks, transfusion centers, hospitals, and clinics. There has been an extensive use of warming and thawing systems in biopharmaceutical industry to revive the cryopreserved cells and then use it for manufacturing various biopharmaceutical drugs. Manufacturing of such biopharmaceutical compounds require human cells, DNA and proteins to be thawed that are preserved under low temperatures. Few restraints such as strict regulations related to thawed biomedical products and samples and issues related to large batch size might hinder the market growth in the long run. Manual biomedical warming and thawing devices market segment held around 55% share of total product market valuation, accounting for a total value of USD 91.3 million 2017. The wide application, lesser cost and easy availability of manual thawing devices are contributing towards the large market share of these devices. Some of the players operating in this segment are Helmer Scientific, Boekel Scientific, Sartorius AG and Barkey. Automatic biomedical warming and thawing devices market segment is estimated to show lucrative growth in near future; it is estimated that it will grow with a CAGR of 10.8% from 2018-2024. Various companies are manufacturing automated version of thawing devices as it does not alter the integrity and safety of the biomedical sample. In addition, certain advantages such as multiple detection mechanisms, determining vial temperature, phase change initiation and thaw completion will lead to the expansion of automatic warming and thawing devices. Blood products market segment dominated the industry, accounting for USD 64.8 million in 2017. 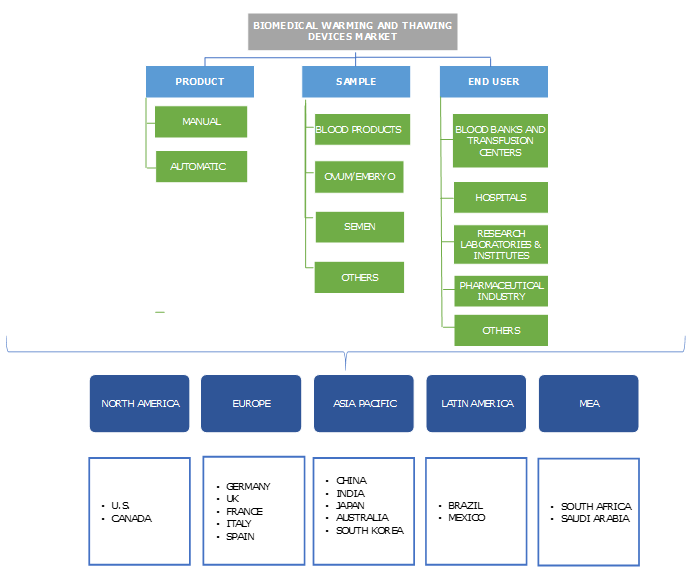 Increasing road accidents and trauma cases, growing number of blood banks and storage centers worldwide, and greater demand for biomedical research are few of the major factors responsible for the growth of blood products market segment. In addition, fresh frozen plasma in a thawed form is increasingly in demand to be given to patients in order to restore or help to maintain their coagulation factors such as Factor V or Factor VIII. Ovum/embryo market segment is estimated to grow at a CAGR of 11.0% during the forecast timeframe. Increasing incidence of infertility and greater technological advancement in the field of in-vitro fertilization will help in driving the demand for thawed embryo samples. Increasing success of frozen embryo transfer that uses embryo samples has made it a popular option to consider before moving to another fresh in-vitro fertilization cycle, thereby increasing the application of thawing equipment in hospitals and clinics. Blood banks and transfusion centers business generated maximum revenue share in the year 2017 with a value of USD 44.3 million. Increase in number of blood banks that cater to the needs of rising number of patients admitted to trauma care centres are boosting the demand for warming and thawing devices. In addition, the need to infuse blood to patients at the most adequate temperature is also diving the demand for thawing equipment, that have the capability to regulate the blood sample’s temperature according to each patient’s specific requirements. Research laboratories market segment is expected to experience robust growth in the biomedical warming and thawing devices market at a CAGR of 11.6% over the projection period. Plant tissue culturing, animal tissue culturing and many other potential applications will drive the growth of research laboratories in biomedical warming and thawing devices market. U.S. dominated the North America biomedical warming and thawing devices market with a total value of USD 39.1 million in the year 2017. Presence of large number of blood banks and transfusion centers in the U.S. where frozen samples are stored and thawed appropriately for further transfusion in patients is boosting the market for warming and thawing devices market. The region also has one of the most sophisticated healthcare infrastructures along with number of member organizations set up by the government, that will in turn drive the market growth in the U.S.
India biomedical warming and thawing devices market is estimated to show considerable growth in the coming years at a CAGR of 12.2% from year 2018-2024. Factors such as growing biotechnology studies, and blood transfusion cases in hospitals and surgical centers will drive the demand for warming and thawing equipment in India. The high-unmet medical needs pertaining to the target disease segment, coupled with constantly improving healthcare expenditure in the country are some key factors attributing to market growth. Some of the leading key players include Helmer Scientific, BioCision, Sartorius AG, Sarstedt AG & Co. KG, Boekel Scientific, Barkey, CytoTherm, Cardinal Health, GE Healthcare, Thermo Fisher Scientific. These medical devices companies have implemented strategic decisions to expand their product portfolio and geographic reach. Merger, partnership, acquisitions, new product launches and increasing R&D activities has increased the company’s effective capabilities and hence resulting into better sustainability in the market. Biomedical warming and thawing devices market have a very few companies capturing the largest share in the global market. The market will continue to grow in the future due to its increasing applications not only in the field of blood transfusions but also in biotechnology as well as pharmaceutical industries. 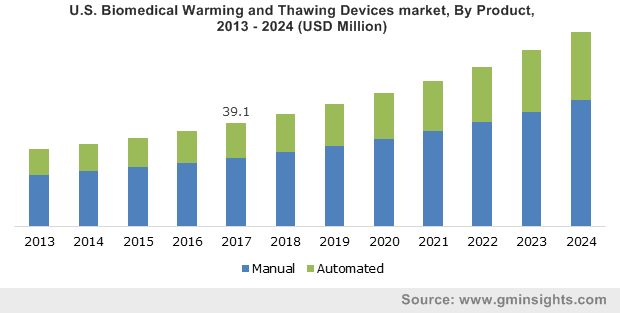 The market will see gradual shift towards the application of automated thawing devices due to its controlled thawing processes according to the user’s specific requirements, which will consequently boost the market growth over the forecast period.